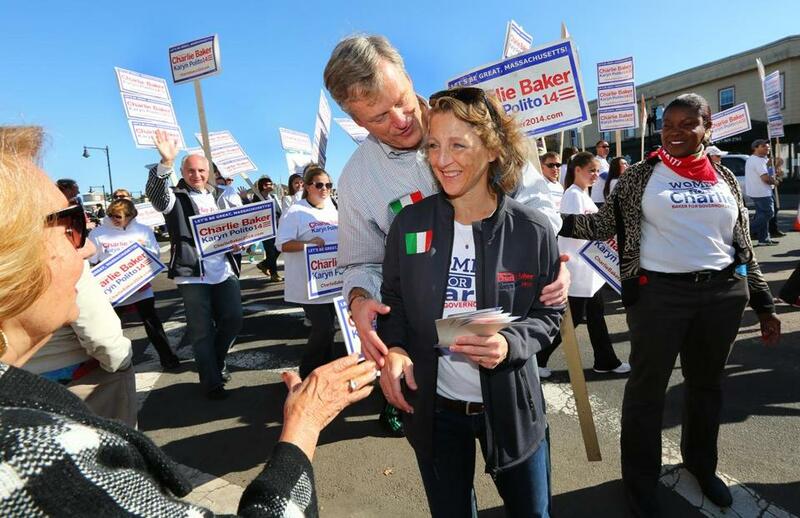 Republican gubernatorial candidate Charlie Baker campaigned with his wife, Lauren, in East Boston earlier this month. Lauren Baker learned how to pitch products like Labatt beer and Lotus Notes during her 13 years as an executive at a prominent Boston advertising agency. During the last year, she has been sitting in on strategy meetings, reviewing rough cuts and scripts for television ads, and crafting the marketing toward women for a brand much closer to her heart: her husband, Charlie Baker, the Republican candidate for governor. 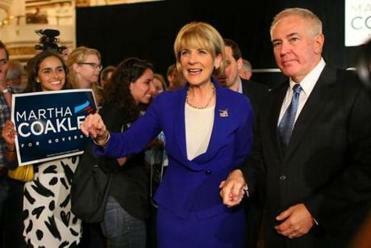 After staying on the sidelines during his 2010 run for governor, she has taken on a much larger role in this campaign, as a key voice shaping her husband’s message and as an outspoken leader in his drive to cut into Martha Coakley's lead among women voters. Baker said she is fascinated by political strategy and familiar with media and communications as a former account executive at Hill Holliday, where she worked until 1999, when she quit to become a stay-at-home mother. Thomas O’Connor is a constant presence behind the scenes, traveling with Coakley and acting as a tough critic, she said. “When there’s communication, or direct mail, or TV, or video, or even just the logo or the branding of Charlie, I want to be involved in that because I think I understand both the brand — the person — and the process,” she said. 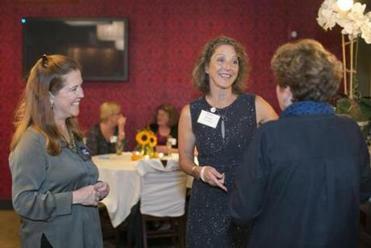 At the Women for Charlie meet-and-greet event, Baker chatted with Eleanor Greene (left) and Karen Hickman. Now, she is active in the campaign every day, speaking at fund-raisers and house parties, writing a weekly newsletter to female supporters, recording YouTube videos, and stumping alone and alongside her husband. At a recent Women for Charlie event in West Roxbury — one of 50 she has hosted across the state — she mixed homespun anecdotes about the travails of day care pickup with some sharp jabs at Coakley’s efforts to win women’s votes. The crowd of about 30 women broke into applause. Later, asked about the battle for women’s votes in an interview, she was just as plain-spoken. “The first thing is: There’s no war on women,” she said. “I just find that insulting. It’s dumb.” At that point, the campaign manager, Jim Conroy, cut in, insisting she go off the record. Baker is valuable to the campaign not only because of her advertising experience, but because she has known the candidate for 30 years and can help soften the hard-edged image he cultivated in 2010 when he tried to tap into voter anger at Beacon Hill. They married in 1987 and now have three children: Charlie Jr., 23; A.J., 20; and Caroline, 17. When she quit her job in 1999, she said she had been looking for a change and needed to spend more time with her children. Her husband had just become chief executive of Harvard Vanguard Medical Associates and was “never around,” she said. Though she became active in charitable work, she said it was hard giving up her career. “It’s difficult when you’ve been a working person and then, all of a sudden, you’re a stay-at-home mom, and people say, ‘Well what do you do?’ And you’re like, ‘Well, nothing,’ ” she said. Despite her husband’s well-publicized $1.7 million salary as chief executive of Harvard Pilgrim Health Care, she said the family also worries about affording college and retirement. It was one of the main concerns she had about him quitting Harvard Pilgrim in 2009 to run for governor the first time. During that race, she devoted about one day a week to the campaign so she could spend most of her time with their children. Now, the children are older (Caroline has appeared in an ad, saying “he’s totally pro-choice,”) and Lauren Baker has become a frequent speaker at campaign events, testifying to her husband’s qualities as a father. In West Roxbury, she recounted that, when he was a top budget aide in the Weld administration in the 1990s, he would leave work in the evenings to feed, bathe, and put the children to bed. “So when people try to tell you that Charlie can’t relate to the trials and tribulations of being a working mother – trust me, he knows, because he lived it,” she said. Research shows these kinds of messages, called “maternal appeals,” are most effective on behalf of Republican men, who are more likely to be viewed as lacking compassion, said Jill S. Greenlee, a Brandeis University political scientist. Baker also fields questions about policy, and jots down voters’ concerns in a notebook that she takes back to the campaign staff. In West Roxbury, she received a warm response. 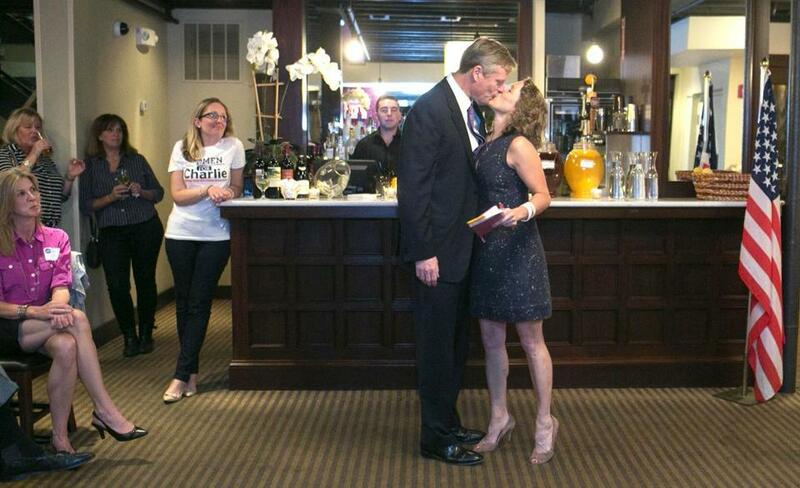 GOP gubernatorial hopeful Charlie Baker kissed his wife, Lauren, when he made an appearance at an event she held in West Roxbury.